If you suffer from high blood pressure, hypertension, arthritis, depression, anxiety, or want to relax more or soothe your tired and sore muscles, a home massage recliners is an excellent investment for personal care. Studies have consistently shown the health benefits from regular massage are so numerous that they're almost hard to quantify, and the list continues to grow. If you’re a fan of the brand or have just been doing your research, checking price, and reading Cozzia reviews, you’ve probably seen the top-rated models and are narrowing down your search. I love the Cozzia 16027 for many reasons, but let’s start with the advanced technology massage and cutting-edge engineering. This model allows you to recline automatically, and the footrest can be adjusted independently from the back. Zero gravity positioning lets you fully recline to either a flat or more than flat position. Reclining so that your feet are above your heart increases blood flow and circulation. This also takes all of the pressure and weight off your spine and connective tissue, which is the optimal position to relieve lower back pain. This technique was designed for use by astronauts during takeoff and works ideally in massage therapy. Heat is an added benefit when you’re getting a massage, and this model has it. When you add heat, the area around your muscles and joints, as well as the connective tissue in your body, can loosen up and relax. This enables higher blood flow through the muscles, which increases circulation, improves relaxation, and invigorates your mind. You can choose from nine different techniques, five levels of speed and intensity, and three adjustments you can select for width. If you like choices, you’ll quickly see, this model will keep you busy. You can select from Shiatsu, Swedish, tapping, kneading, clapping, dual action, rolling, triple action, and vibration. The airbag system delivers deep compression massage in the feet and calves as well as the seat and back. If you prefer to create your program, you can adjust to suit the style, speed, and intensity of your choice. If you like less thinking and more relaxing, you can pick from one of the six built-in programs, lie back, and let your tension and stress melt away. Programs can be set to last from five to 30 minutes, and there’s an automatic shut-off built in for safety. The computer scan checks for your height and adjusts accordingly to fit your body, and the S system delivers massage that conforms to your shape. If you prefer partial rather than full massage, you can select for that instead. Air pressure massages the lower body and the seat massage is vibrational. The footrest is fully adjustable independently, which is excellent for ensuring the perfect fit whether you’re tall, short, or anywhere in-between. This is also ideal for making sure you get the right amount of pressure and compression on your lower legs. Beyond the engineering and techniques that make this a standout, there are a lot of higher end facets that we like in this model. When you’re looking across the spectrum, sometimes the small things can make a big difference. You can adjust all of the features via the easy-to-use and visible in any light remote control. And one thing we especially love about the 16027 is that it also has a small remote control that makes it easy for you to adjust your settings while you’re fully reclined in the zero gravity position. It’s like an astronaut pen only better. The 16027 includes an easy to read a manual that details instructions, installation, programming, and adjustments. And should you misplace the user guide, it’s available online. There’s also an excellent video on installation, which is a helpful way to get set up and running quickly and easily. The 16027 has been replaced by 16028 (see note above), so it’s important to check the warranty by way of the serial number. Cozzia generally offers a warranty that covers parts for two years. If something breaks or stops working correctly, they cover in-home repair for one year. The whole line of Cozzia models is excellently crafted and well revered in the industry. By way of comparison, it's worth taking a look at both the Cozzia CZ-628 and the EC-618. These both offer high-end features and engineering as well as cutting-edge techniques. If you like luxury, elegance, and top-of-the-line products and technology, the 618 and 628 are two you're going to want to explore. They both utilize advanced 3D technology, which most closely imitates human massage. This allows the rollers to penetrate deeply into the muscle tissue, so instead of just up and down and back and forth, you also get an in and out sensation as the massage goes into your back. They both utilize one-touch zero gravity positioning, which is the best position you can be in to relieve lower back pain and take all strain and stress off your spine. This also improves circulation and blood flow, which improves relaxation. There are 64 airbags in each and three levels of air compression intensity to choose from. With the Cozzia 628, you get Bluetooth speakers for music or nature sounds to soothe you while being massaged. It also comes with a two-year warranty for both parts and in-house repair. The 618 offers two years on parts and one year on in-home servicing. The 618 has lumbar heating for your lower back and is MP3 capable. The 628 has USB charging, so you can use and charge up your devices as you relax. 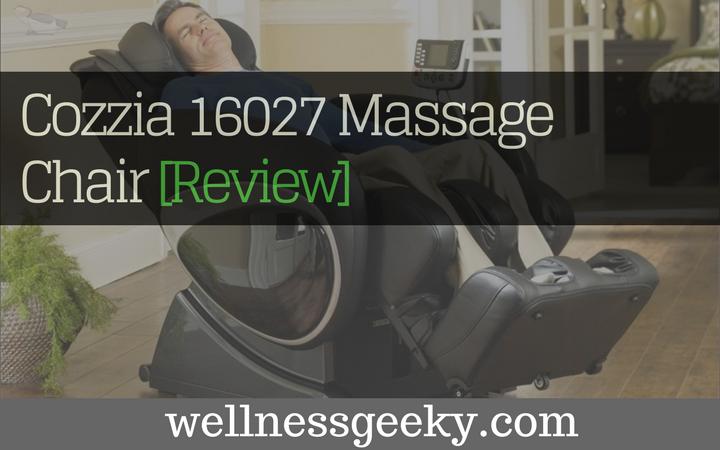 The 16027 is a fantastic chair for the price point, features, technology, and excellent massage therapy it offers. Customer reviews are resoundingly positive, and few regret picking this chair from among the thousands out there. Most state it's the best investment they've ever made and would never regret the purchase. We know that science backs up the efficacy of human massage, and the same now holds true for chairs we well. For relieving stress, sore and stiff muscles, and for improved overall health and wellness, it pays to invest in a home massage chair. And you can't go wrong with the 16027. It looks great in any room and will make you feel even better.